It feels great to run a photography business. There is nothing interesting like knowing that you are your own boss. But being your own boss calls for accountability, which is why keeping financial records of sales and purchases in your photography business.I understand that you are busy, and at times the amount of work you have maybe overwhelming, leaving you no chances of creating the Invoice Templates from scratch. 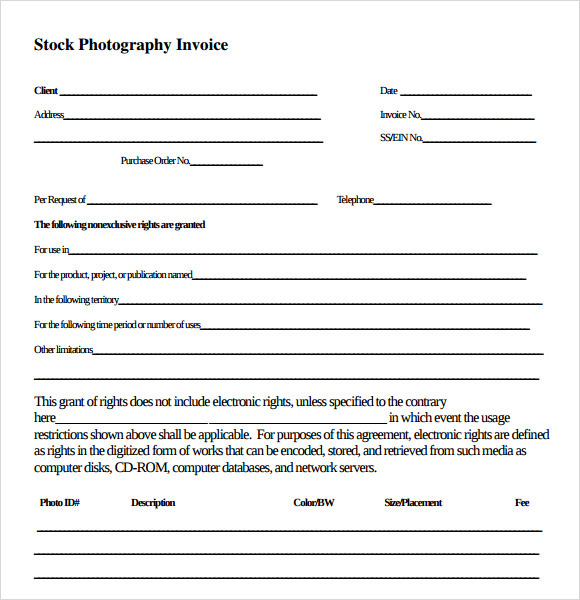 Instead of considering to hire someone, it would be a great idea to employee the use of photography invoice template. 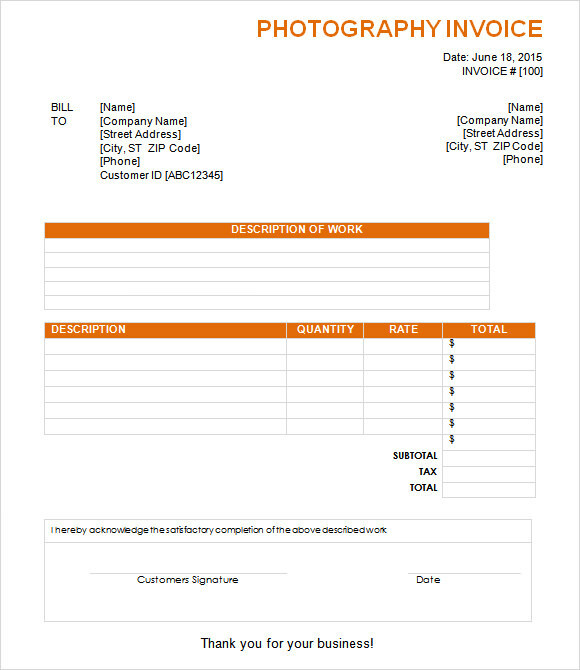 You can download this free Blank Invoice Templates by browsing the options available her. These are collected from different sources to ensure that you have access to the best quality on a single page. 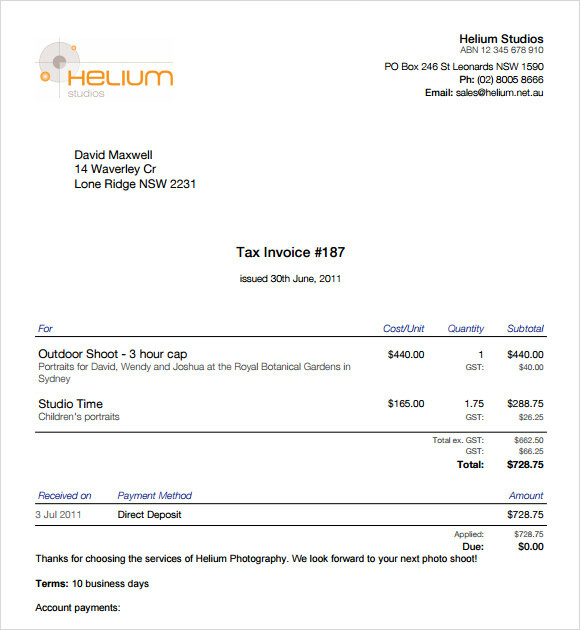 The photography invoice template consists of an invoice specially designed for photography work. It showcases details like the date, name and contact information of the customer and your name along with your contact information. It also has space to give the description of work and the total amount to be paid by the customer. 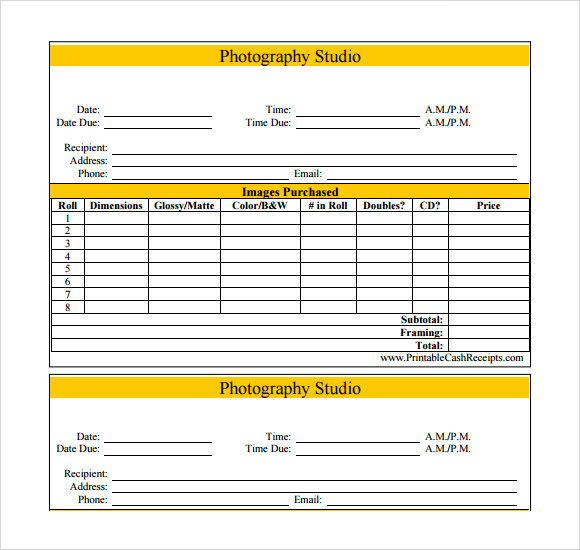 The photography receipt template provides you with the receipts. These receipts can be straight away printed and used. It has all the prominent information about the photography studio and the pictures purchased. It also mentions the subtotal amount, framing charges and the total amount to be paid by the customer. 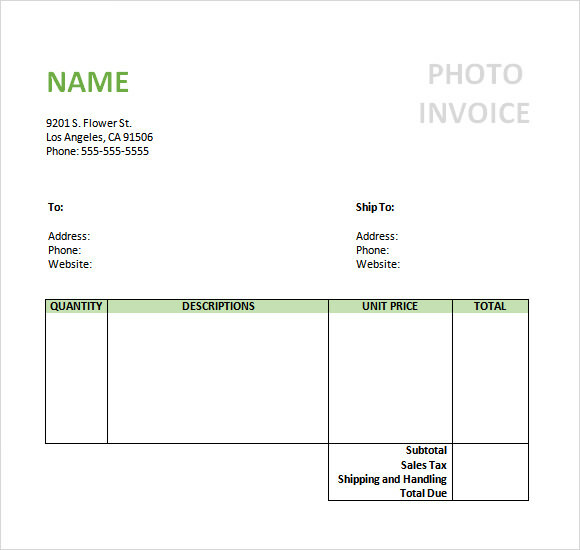 The photography invoice template download consists of a printable invoice. This template showcases the details like the description of the work, quantity, unit price and total. It also highlights your name and your contact information along with the name and contact information of the receiver. The free photography invoice template PDF comes in PDF file format and can easily be converted into other file formats. This template consists of all the required information in the invoice like the quantity, description, rate and total amount. It also highlights your name and contact information on the top of the invoice. Why Is the Photography Invoice Template Needed? 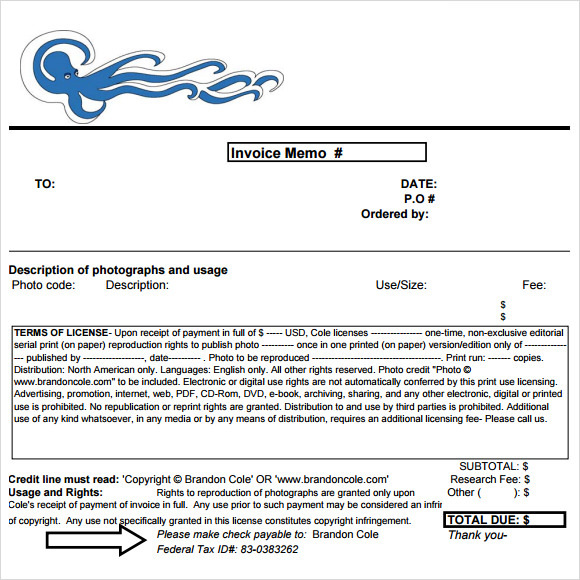 The photography invoice template is needed for preparing the invoices with its help. The templates are already formatted and consist of all the details which are required to be present in an invoice like the total amount, your name and more. The photography invoice needs different format from normal invoice, information like the name of the photography studio, description of work / photographs, the extra amount of frame (if applicable) and more. The photography invoice template provides you with all these details and you can just print the template and directly use it. It has designated spaces for all these information which also helps in saving your time. You may like Commercial Invoice Templates. 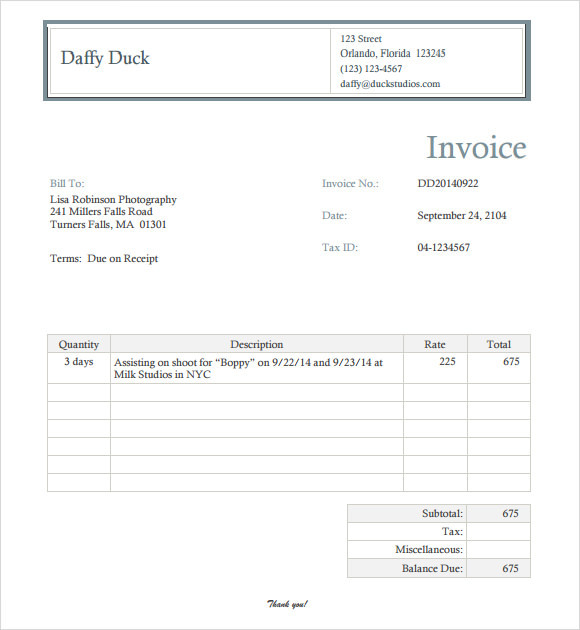 When Is the Photography Invoice Template Needed? The photography invoice template is needed at the time of making the invoices which are to be given to customers for providing them with the description of work and the amount to be paid by them. You can also keep a copy of this invoice with yourself in order to keep the record of your work. 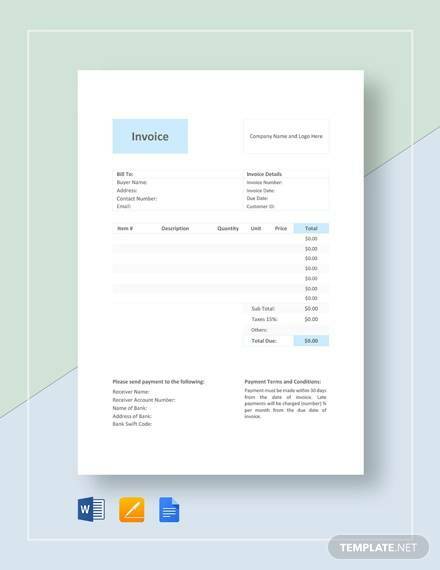 These printable invoice templates make it so much easier for you to prepare the invoices with the best results. These are also needed for managing the operational benefits of your studio. It is also needed to present or keep the information in an organized form. The photography invoice template has numerous benefits like it helps in improving the customer satisfaction level by providing them all the details. It also makes it easier for to organize all the information in an organized manner. It helps in keeping the records too. Along with all this, these Invoice Templates being already formatted consists of all the required details in it which also saves your time. These templates are also reusable and you can print as many invoices as you want with it. It also comes in various designs in order to suit different needs and purposes. The photography invoice template is easy to download and use as well as it has a user-friendly interface. These are ready to use templates and can be used just after printing. These invoices have all the prominent information which is required to be present on a photography invoice.